Loomstate !Act Natural! Blog: NY Urban Field Guide - New Class! NY Urban Field Guide - New Class! 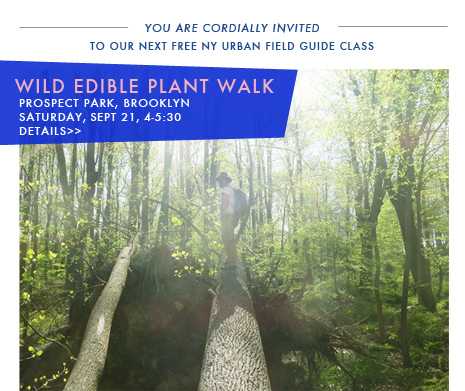 Join Rhett, Loomstate’s Sustainability Director, on a Wild Edible Plant Walk Saturday, September 28th in Brooklyn. This free event is part of our summer environmental class series NY Urban Field Guide. Boasting an encyclopedic knowledge of our home grown botanicals and applying his skills as a celebrated NYC afterschool nature and food educator, Rhett invites you on a unique adventure into Loomstate’s NYC. Be prepared to find a range of exciting herbs including Poor-man’s-pepper, Jewel Weed, Mugwort, and Black Birch, along with early Fall nuts - Beech, Hickory, and Hazelnuts. Walk and taste with us from 4-5:30pm, starting from Grand Army Plaza Entrance to Prospect Park. RSVP to RSVP@Loomstate.org soon as classes fill quickly.